We’ve all heard the numbers about investing in the stock market – over half aren’t even investing and Millennials supposedly like the stock market even less. There are many reasons for this, but chief among them are a poor economy and a lack of basic financial literacy among the population. In many cases though, the decision to not invest in the stock market boils down to believing lies about investing. I heard these lies everyday as a stockbroker. A client I was speaking with would make a statement that was absolutely false. That’s not a criticism; it’s to point out that there are many investing lies and falsehoods we believe and, in too many instances, they hold us back from growing wealth the way we should. One of the biggest financial mistakes I regret was giving into the lie that you shouldn’t invest when paying off debt. It made sense not to invest at the very beginning of my debt payoff journey as I had very little to throw at my debt; but the last 3+ years, I could’ve thrown something at retirement. Not investing then because I believed I shouldn’t put me that much further behind saving what I need for retirement. 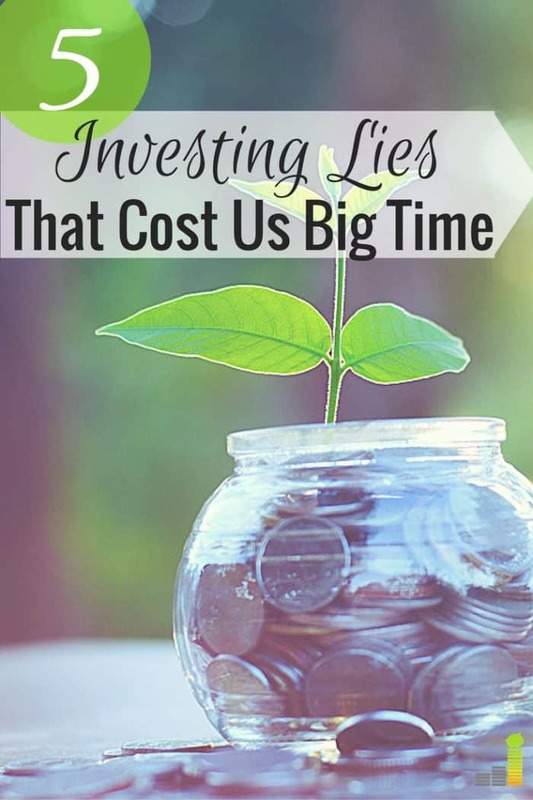 Following are five other costly investing lies far too many of us believe. I realize in certain situations some may not be able to invest in the stock market. They may be in a lower-paying job or worse. That’s not who I’m talking about here. I’m talking about individuals in decent paying jobs who are able to free up money to invest. The worst believers in this lie are those who have access to a 401(k) plan through their employer and yet don’t invest (even with the option of a match – gasp!). Yes, it does help to have more money when you invest in the stock market, but it is by no means required. There are many ways to invest in stocks with little money; you simply need to start. While some brokerages do require at least $1,000 to invest, many others don’t. Brokerages like Betterment, Wealthsimple and Ally Invest all allow you to start investing with no minimum balance requirement. If you have access to a 401(k) plan, then most allow you to start with nothing and then begin pulling money out of each paycheck automatically for you to invest. It’s really that simple but, again, you need to start. If coming up with the money to start investing is a challenge, there are many ways to save money every month. Pick a few and throw the savings into a brokerage account. You can go the other route and find ways to make extra money and throw it at a brokerage account. Regardless of your choice, you can invest with little money and do quite well. John Oliver took on this investing lie recently. You know the argument; you get what you pay for. Thus, when you buy “on the cheap” it’s of poor quality and when you pay more it’s high quality. Investing in the stock market isn’t like going furniture shopping – it’s often the exact opposite. Far too many times to count in my former day job I would speak with clients who complained about their financial advisor. Nearly every time the number one issue was compensation – they were paying their advisor way too much money and assumed that the hefty price tag or exorbitant fee translated into higher quality financial advice and/or investment performance. In reality, all they were doing was lining the pockets of their financial advisors, who often had them invested in poor products, which caused them to lose even more money. There are many good financial advisors out there, and they’re worth what you pay them, but in many instances, low-cost index funds can grow your money just as well if not better than an actively managed fund. This is probably the investing lie I understand the most. The stock market is overwhelming to those new to investing. There are tens of thousands of stocks, mutual funds, ETFs, etc. to choose from; it’s like hell’s cereal aisle and new investors can easily become paralyzed by the over-abundance of choices. If you weren’t taught about investing by your parents or in school, then beginning to invest can feel like having a conversation in a foreign language. That’s how my investing life began. I was completely clueless about investing, and I had no idea where to start. I found ways to learn about investing from reading books on investing and researching things online. After a little while, I became more comfortable with investing and could act with confidence. The point? You don’t need to be an expert to start investing. You simply need to learn a little so you can be comfortable with it. There are many ways to learn about investing – most 401(k) plans offer educational resources, there are books for beginner investors, free courses taught by online brokerages and more. Find something you like and start teaching yourself. You can also use a robo-advisor like Betterment, to manage the investing for you now while you learn how to take it over yourself. The retirement landscape has changed a lot over the past decade or so. It’s no longer expected that you work at the same corporation for three or four decades and then retire with a gold watch and a fat pension. We now have more responsibility and the image of “retiring” to do little holds less value today. Does this mean you shouldn’t save for retirement? No! Even if you plan to work later in life, it’s still important that you actively invest in the present. You never know what will happen over the next few decades. You may find that you do want to stop working at a certain age. You may have a health issue that will keep you from working. You may want to travel more or take up residence in a more expensive location. Any of those options, and more will require a sizable amount of money, thus the importance to start investing when you can. How many times have you heard someone say, “I’ll start ‘X’ next year.” If they genuinely start next year, that’s one thing, but how many times does “next” year turn into two, three, four years, or more? When it comes to investing in the stock market that puts you even further behind where you need to be. I’ve written about this before, but it’s known that those who put off saving for retirement until age 45 must save three times as much as those who started at age 25. Why is that? Time is arguably the most important facet of investing; it can be your best friend or worst enemy. It’s those who start investing as soon as they’re able that put themselves in the best positions possible. Yes, they may not be starting with much, but that’s not the point. The point is they started and time will do wonders with what they’re doing with their money. Ultimately, it’s the discipline they’re establishing that matters and the rest will take care of itself. There are other investing lies out there, but these cover the important points – that you need to start saving as early as possible and educating yourself along the way. As the saying goes, no one will care about your money as much as you – so take yourself seriously and start investing today. What are some other investing lies you’ve heard? What’s one you’ve been guilty of believing in the past or find yourself believing now? When did you start saving for retirement? I wish I had understood the power of index funds at a younger age. I opened a Roth IRA at 18, and I still kick myself for keeping actively managed funds in there as long as I did. I also regret the year I stopped investing completely! The stock market crash in 2008 totally freaked me out. Expensive lessons learned! A lot of people held out as a result of the crash – unfortunately too many stayed out too long and entirely missed the upswing and lost again. I was similar when I finally started investing. I was far too active and likely lost out instead of taking the passive approach. I hate it when people say they aren’t saving and investing because “they’ll never retire.” Why do people pretend to know how their lives might be 10, 20, 30, or 40 years from now? I’m with you there Holly. It drives me nuts to hear people say that as it’s so shortsighted. Another inexpensive option for beginning investing (beyond the 401(k) if you have one) is to open an IRA. Most places have much lower thresholds for opening an IRA than they do their taxable brokerage accounts. For some, you don’t have to invest anything to set them up if you set up a monthly deposit. My biggest barrier was #3. I always felt like the stock market had some secret code that only those on wall street really understood. Once I finally took the initiative to do some reading, I realized it doesn’t have to be complex and I chose to invest in the areas I understood the best (hello index funds!). That gets a lot of people Amanda. Thankfully there are so many resources out there that can simplify things and make the market easier to understand. Number 3 has been holding me back for years and it is only recently that I realized it’s best to learn along the way when it comes to investment. I’m now waiting for the next market crash to deploy a bit of money – yes, I’m still pretty risk averse because it’ll be my first stock purchase…maybe that could go in the list too! Like I said to Amanda, that gets a lot of people but good for you for learning along the way. Completely agreed Richard. I think it provided a key lesson and kudos to you for taking the available opportunities. I was able to do similar and has been nice to see it grow. Very cool, congrats, that’s the way to do it! The whole “I don’t plan on retiring” is a tough one for me to stomach. This seems to be an opinion that is growing in popularity. I can absolutely see the benefit of doing some sort of work in retirement. It keeps you active and engaged, makes you feel like a productive member of society, etc. But you never know what’s going to happen. With modern medicine people are going to live longer and longer, but it also means a better chance of living with a chronic condition. You never know how a chronic condition – or multiple chronic conditions – will impact your ability to work. It’s best to plan on retiring and then NOT retire if you don’t want to! Exactly DC! That sentiment drives me nuts. I understand not wanting the traditional retirement. I know I don’t want it, but that doesn’t mean I’m going to the other extreme. Like you said, you never know what’s going to happen and you very well may have some health issues that can be managed. I’d much rather have saved/invested and have that to fall back on/pass on than to not save enough and it impact what I can or can’t do later in life. It’s all about having available options in my opinion and investing for retirement allows for that. This is a great list! I definitely have bought (no pun intended) into the lie about investing in the stock market. Its intimidating when you haven’t done it and don’t know where to start! We have a unique debt situation– paying off more than 550k in student loans so we are focusing on those before we invest but maybe we should rethink that! Thanks Amber! It can definitely be intimidating and was once there myself. Thankfully it doesn’t take much education to get started and find a comfort level. I can understand wanting to kill those first, but coming from someone who put it off don’t overlook those lost years – especially if you have access to a 401(k) with a match. Thanks for stopping by! Very true with the “I’ll start next year” lie. Biggest barrier to entry is just getting started. Once you start saving, you really don’t notice it. You just get used to what’s appearing in your bank account. You really need to start doing something right away to get those savings muscles going. Completely agreed. It’s taking those initial first steps that matter. Once you do that, assuming you do it wisely, momentum can step in and help grow your money. I used to think the stock market was for the wealthy only. It was definitely a lack of financial education which luckily got straightened out while I was still pretty young. 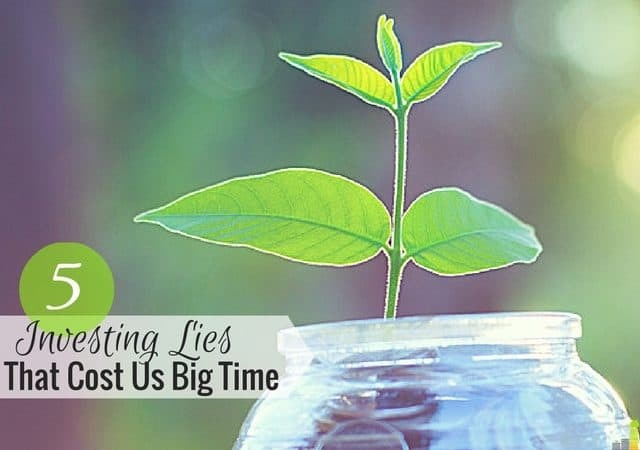 Thanks for debunking these very common lies! I think a lot of us can be tripped up by that Kalie. It’s easy to think that way for many which is why literacy is so important. I started an invest account 17 years ago, unfortunately life got in the way and I had to sell all me stock to make ends meet 8 years ago when I lose my jobs. I now have stage 4 cancer (since 2015) but I am still going great; I just wish I could have kept on investing. I am now looking into starting again but have very little money, but starting some where is the key. So for those who think that you do not need to plan for retirement think again. If I had; had the knowledge and ability I won’t be struggling now. What are you thoughts on cyptocurrenty? Sorry to hear that Laura. That said, your thoughts are right on – start as early as you can. With regards to crypto, the very little I know, I’d run as far away as I can to be honest.